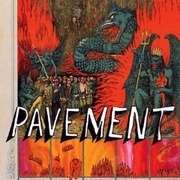 Pavement are probably the world's best known unknown band. American indie godheads to the kind of people who read The Quietus, listen to 6 Music, and pack out the chalets at All Tomorrow's Parties every year, the profile of Stephen Malkmus and co in the world at large – the world of Lidl multipacks of beans, unreliable politicians and plastic celebrities dancing on ice – is significantly lower than that of the That's Life dog that said "sausages" in the public's consciousness. This mainstream obscurity is a thing to celebrate, because Pavement, in all their wonky, lo-fi, sardonic glory are ours. As they gear up for a set of reunion shows climaxing with a headline set at ATP, they present Quarantine The Past, a Greatest Not Quite Hits that has sees the band summoning the gall to false start their own fans, kicking off with a warm but urgent 'Gold Soundz' before whipping the rug out from under us with largely unknown rarities 'Frontwards' and 'Mellow Jazz Docent', which never even appeared on any of their albums in the first place. It's a typically, gorgeously awkward move from a band who revel in dryly delivered sarcasm, be it the withering put down of skinny-jeaned hipsters in 'Cut Your Hair' or the eye-rolling account of Lollapalooza living in 'Range Life'. Which is all well and good, but it's unlikely they'd be so revered and so influential to a generation of bands if there wasn't so much love and beauty in their work too, in the simple affective longing of 'Shady Lane' or the fuzzy, distorted romance of 'Summer Babe (Winter Version)', or from the gleeful, tongue-in-cheek fist pumping of 'Stereo' to the chiming, feedback-drenched 'The Unseen Power Of The Picket Fence', in which Malkmus – all wobbly vocals and pure joy - professes his adoration of REM. Because he gets it, he knows what it's like to be a fan, and that's why they've given us a collection that's more than your average best of – it's a shoebox under the bed full of fading photos and treasured mementos, a time capsule of treats that trusts us to appreciate more than just the obvious hits. Who needs order when a stream of consciousness proves so much more interesting?